A collectible publication for graphic designers and creative entrepreneurs, Color Library is the outcome of one of the most talked-about projects of recent years in the graphic-design field. The Color Library project is a database of color profiles for artists, designers, photographers and printers looking for a fresh but professional color-management solution. It offers a wide variety of color combinations, from basic colors through metallic, neon and pastel. Created at ECAL/University of Art and Design Lausanne, Color Library was launched in 2014. Initially developed for experimental purposes, the project was extended in order to create an online platform for development and distribution. This nonprofit website has a dual objective: to distribute an innovative tool for artists, designers and printers, and to make students aware of color theory and color management―one of the main fields of contemporary design research. Among the graphic designers and creative structures that have used and/or are using Color Library are Åbäke, Vitra, Baldinger Vu-Huu, Edition Patrick Frey, Zak Group, Istituto Svizzero, Kunsthalle Basel and Nero Publishing. 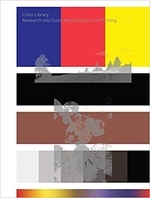 The publication documents the different chromatic and technical possibilities offered by Color Library and includes a commissioned visual essay by Zurich-based photographer Shirana Shahbazi, as well as essays by London-based writer, curator and graphic-design expert Emily King, Manon Bruet and Franz Sigg.